Iron Grip: Marauders is a browser game unlike any other. Whether you are sailing above the world in your own Marauder Airship, or engaged in ground and base combat, you are able to see the game in a way no browser game has ever looked before. 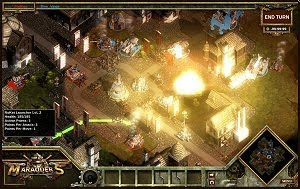 Utilizing 3D tactical combat with strategic browser gameplay, players assume the roles of airship captains able to take advantage of research and engineering to create an entirely unique army to combat enemies with. Choose to fly solo or fight together with other captains in alliances for maximum efficiency! The options are yours – and only you can decide what course to take.